Francophiles regard chervil as the foremost of the five so-called fine herbes, but it has to be absolutely fresh to have any material taste at all—the supermarket stuff is utterly purposeless. It’s used much as serious cooks use parsley, but has a more delicate flavor, with a hint of anise to it (perhaps like a rather mild tarragon). The variety Brussels Winter is marketed as slower to bolt than most (the plant ordinarily does not take well to warm seasons), so that’s our choice (it is reasonably available). Despite having a long taproot when planted in-ground, chervil grows well in pots: all it needs is moderately rich soil, moisture, good drainage, and a sunny situation. It is an annual that bolts easily, so it is probably wise to start a new plant often (chervil matures quickly—in 6 weeks under ideal conditions). Note that chervil seed has a life expectancy of a year or so at most: don’t try to save leftovers from season to season. Chervil wants to be quite well-watered, and dislikes being hot or even really warm. Chervil notoriously bolts quickly, especially in the warmer months; keep its leaves pinched to prevent the small, white flowers from developing (and subsequently forming seeds). Do not cook it any more than you have to. 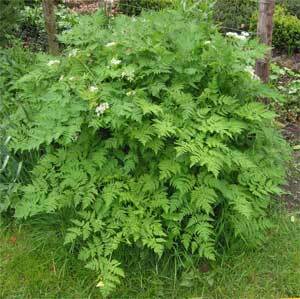 In dishes wanting chervil, it is best added at the last moment, with just enough time to get warm.